I'm REALLY get prepared from my workshop tomorrow, fake tatoo and everything! Question, dear readers. 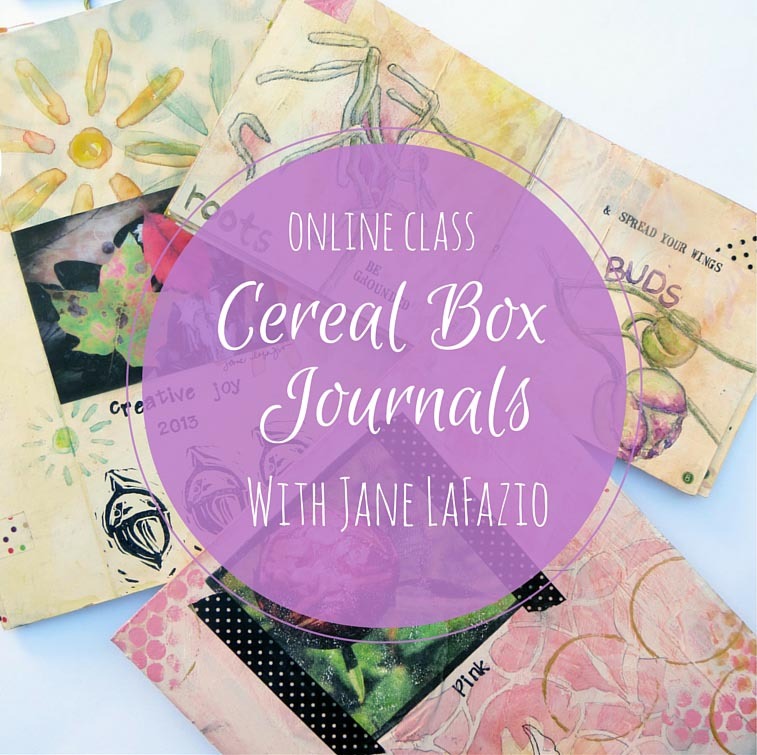 I like doing tutorials on my blog, I've done three so far and plan to do another next month. What would you like to know how to do? Of course, it's got to be something I know how to do! Give me some suggestions, please. Buttons & Blues. 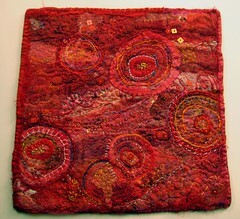 Completed adaption of Recycled Circles, but this time with wool felt.This is 12x12" and was created in separate quarters, then reassembled. 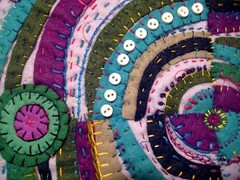 Waay fun to hand stitch. 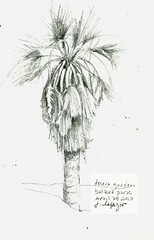 A pencil drawing from last Saturday in Balboa Park. 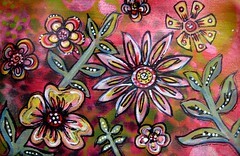 Yesterday, Alisa Burke had a great painting on her blog. It just grabbed me and I had to put aside all my deadlines, and paint my version right away! 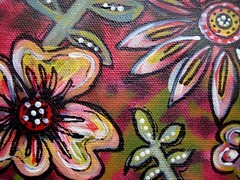 This is smaller than Alisa's, about 6x11" but it was totally fun. 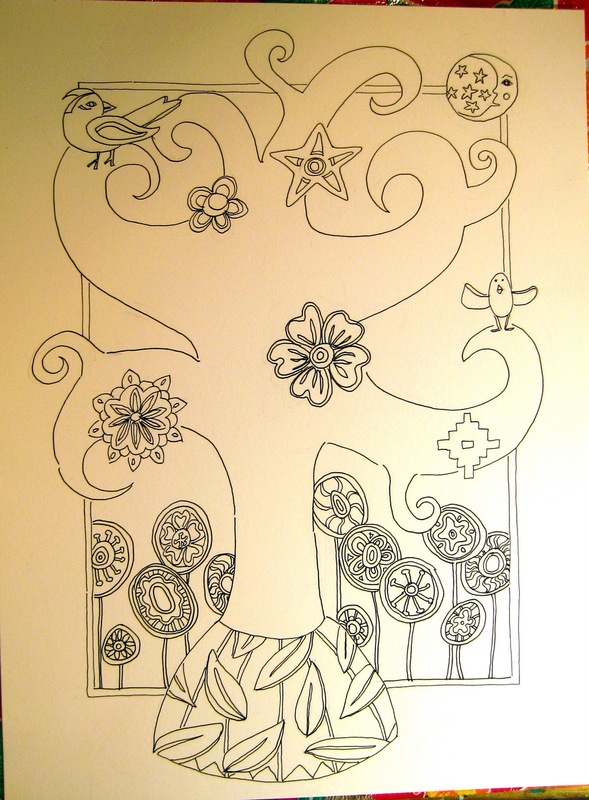 Another 9x12" Tree of Life-in progress- for my upcoming workshop on Saturday.This one incorporate imagery from Design Motifs of Ancient Mexico, a Dover book. 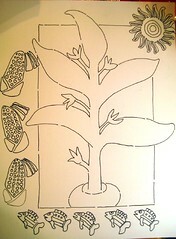 The workshop is geared to ages 12 and up, artists and non artists, so I'm supplying some images they can trace. 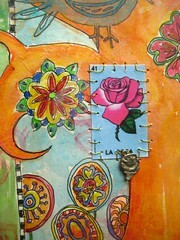 Yesterday was my monthly Art Quilt class, in Escondido. 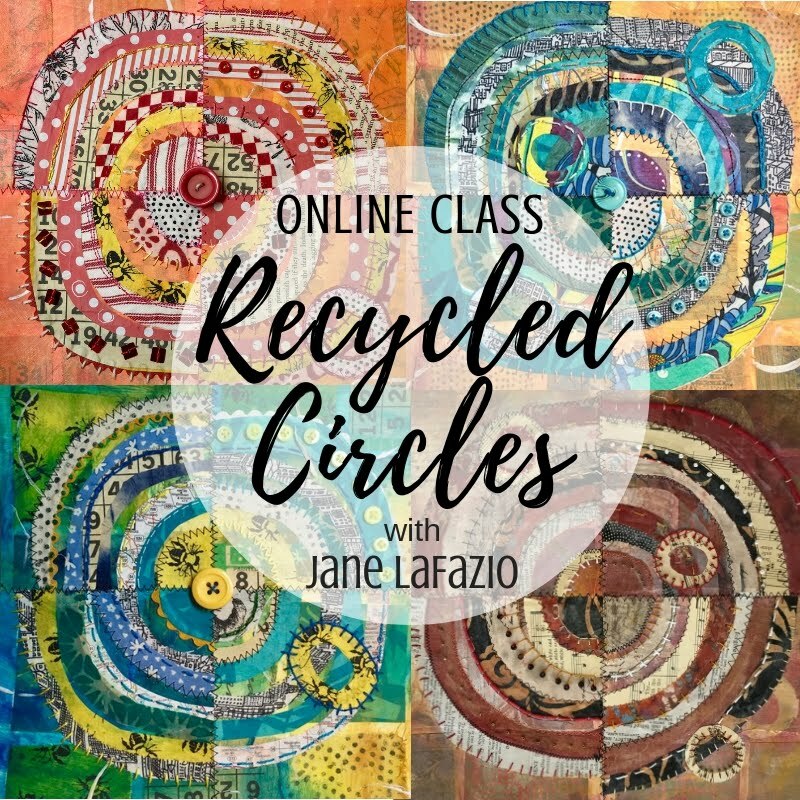 Ileen had requested my Recycled Circles project as one of our lessons, and yesterday was the day. 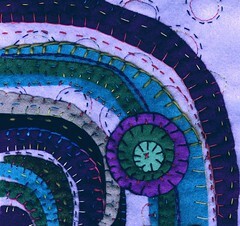 I've done this process in paper, and this time, I used wool felt. Waay fun and easy too! I've got two/fourths done, with two more to go, and I'll post the whole thing. Meanwhile, I am teaching this process in paper at Art Unraveled this year, and the paper version is more complex but equally fun, and frankly satisfying and always successful. We like success. 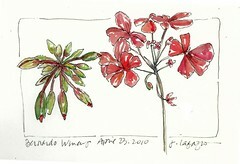 I spent Friday afternoon, at Bernardo Winery, teaching the delightful Toni how to Sketch & Watercolor: Journal Style. I took a workshop today, with the very talented pencil artist, Irina Gronborg.A gorgeous day, spent in Balboa Park drawing trees~ can't get much better than that! 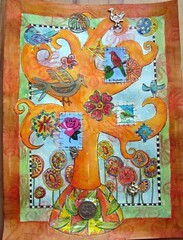 Some detail shots of my latest Tree of Life: Birds & Flowers. That's a milagro and a coin. The coin has flowers on it, even though it appears to be a Korean coin! 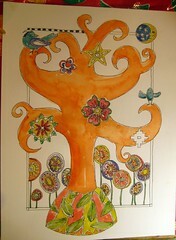 Tree of Life: Birds and Flowers. 9x12" on watercolor paper. 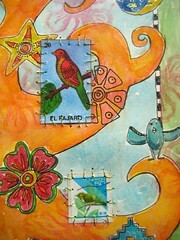 watercolor, collage, color pencil, hand sewing. 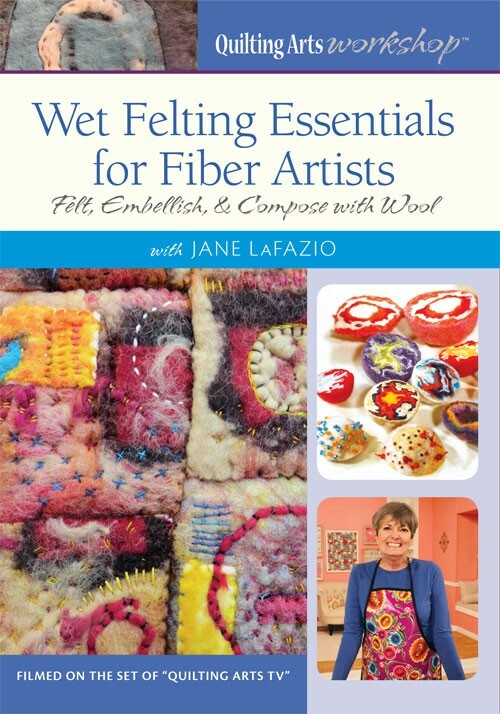 For the workshop that I'm teaching on May 1 at the Mingei Museum that is going to be very fun. There a places one visits that pervade the soul. How could anyone live or visit Sedona and not be affected by it's moutains and color palette? This is a small doodle I created while I was there. Me and the kids from the after school art program, Mundo Lindo, I created and teach once a week. Two hour sessions, free to these 4th & 5th graders. 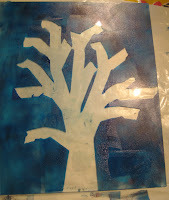 Another work in progress for my upcoming Tree of Life Workshop at the Mingei Museum in Balboa Park on May 1. 9x12" on watercolor paper. 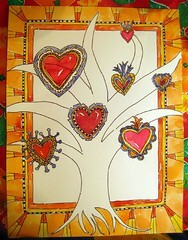 You know I love the Tree of Life imagery and have worked with it for years. I bought this book, Ceramic Trees of Life: Popular Art from Mexico, years ago, and it's full of great inspiration and information. 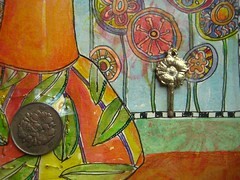 I'll paint more on this piece and then add some collage and heart milagros. Debo Boddiford is the winner of Suzie Schomaker's CD! contact me, Debo. And the winners from my DVD giveaway need to contact me too! Here's a page from my sketchbook, created while looking at the Tree of Life collection at the Mingei. And here's the start of my Tree of Life. I drew it in pencil first, then went over the lines in permanent ink. 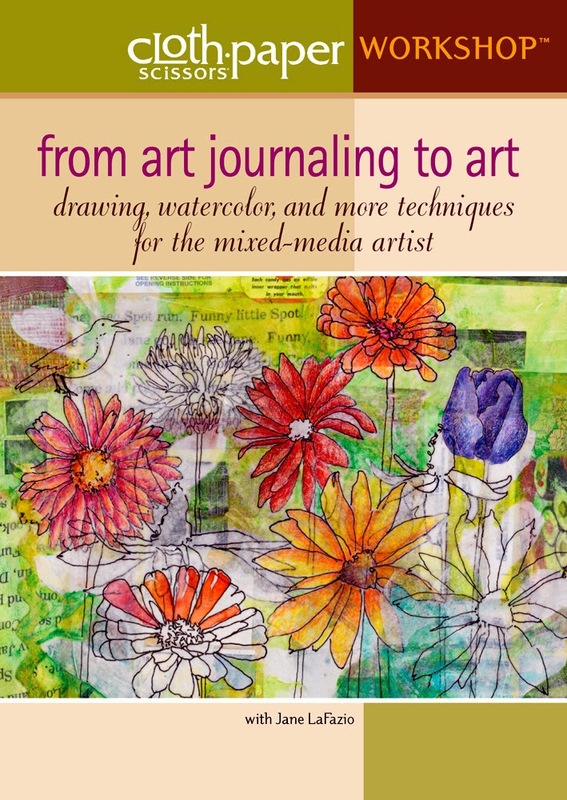 This is part of the process I'll be teaching at the workshop on May 1. 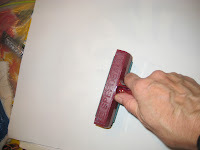 I've stamped the rest of Alma Stoller's fabric with my hand carved stamps. You know, I'm teaching workshops in how to design and carve your own stamps. 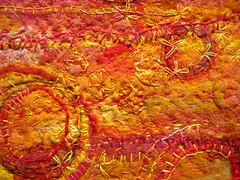 At the Long Beach Quilt Festival July and at Art Unraveled in August. 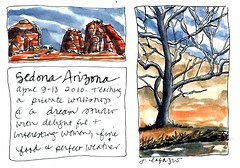 As you may well imagine, my recent trip to Sedona influenced my current artwork. 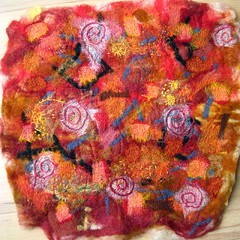 I started this wet-felted piece while I was there, and then when I returned home I machine needle-felted some additional fabrics and ribbon and even threw in a little free-motion machine stitching (circles, what else). Now, the piece is ready to be cut up and reassembled. Yup. I'll keep you posted! 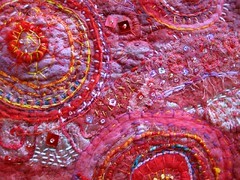 By the way, I'm teaching this technique wet-felting and embellishment on July 6 in Idyllwild, California. Join me for the workshop, and why not come early and take my Mixed Media with Paper and Cloth July 4 & 5th while you're there? 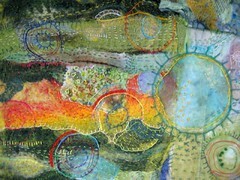 A detail shot of the work in progress, Red Rock Sedona. 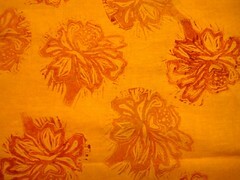 I bought some hand painted/dyed fabric from Alma Stoller's etsy shop and stamped this piece with my recently created marigold stamp. 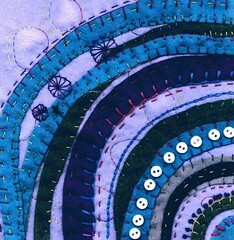 I think I'll use my other stamps on the rest of the fabric and make something wonderful! 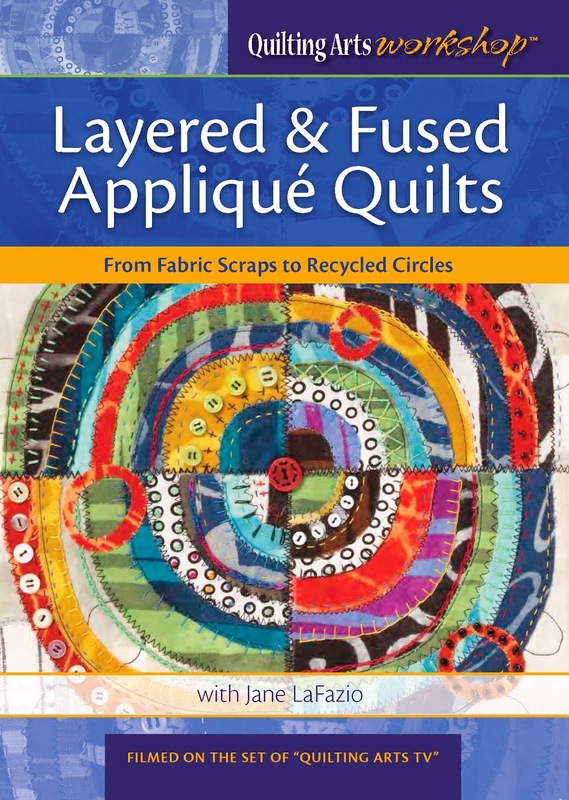 I'm looking forward to Alma's upcoming zine, and know I'll get inspired to create with my cool new fabric. One evening I had the supreme pleasure of hearing Suzie Schomaker perform live, and she kindly gave me a couple of her CDs. GIVEAWAY! Leave a comment, and I'll select the winner of Suzie's CD "Life, Love & Song," check back here on Sunday to see if you won! Me and my most lovely and talented students from the workshop in Sedona, this past weekend. Left to Right, Melissa Andrea, Cathy Gazda, Mary Fisher, me, Anne Brawely Emerson and Penny Morgan. 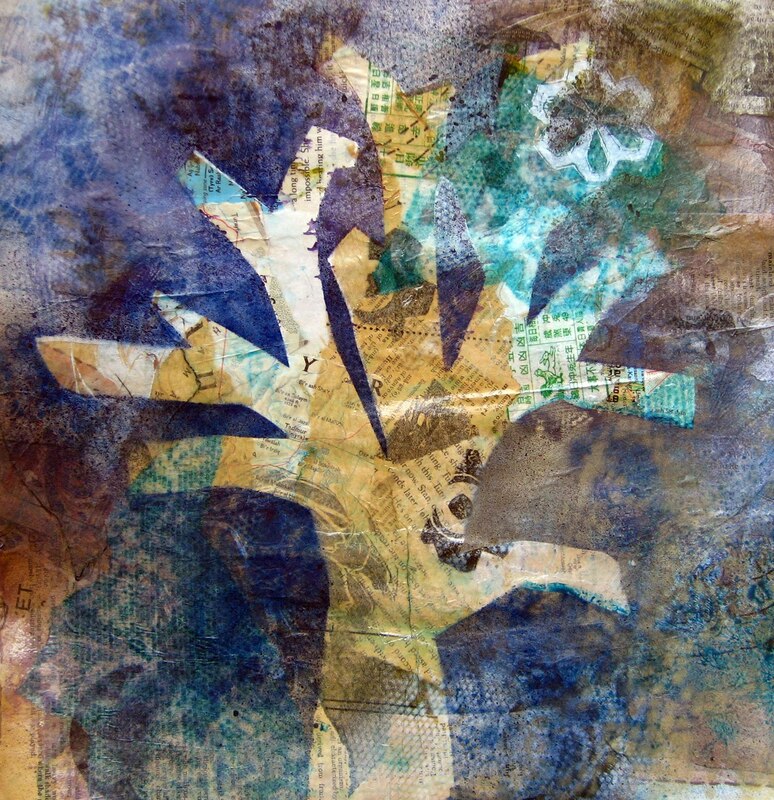 This is a mono print on a paper collage (with a little spray painting too). 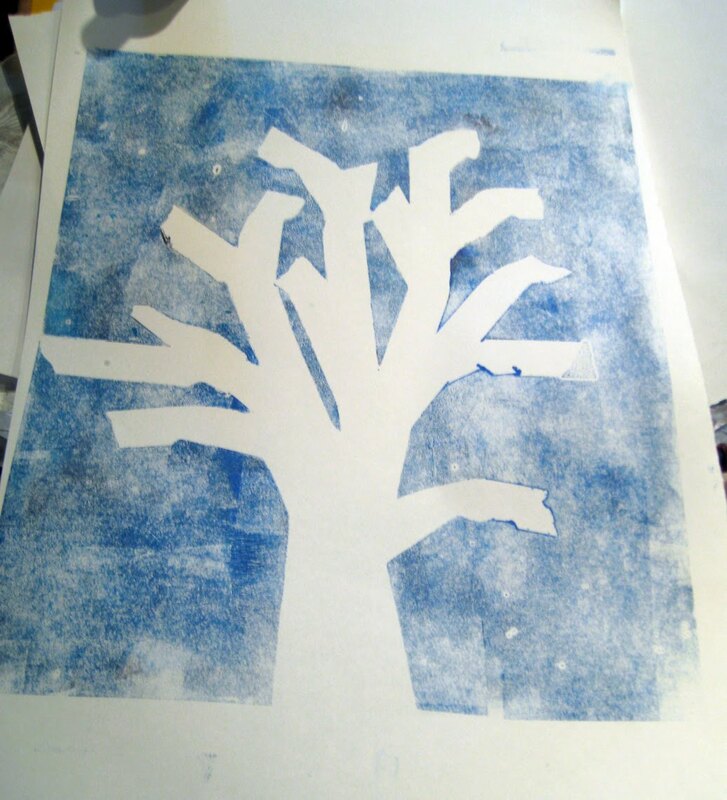 I'm going to show you how I made the tree shape. You need a sheet of plexiglas and some masking tape. I used painters tape here. 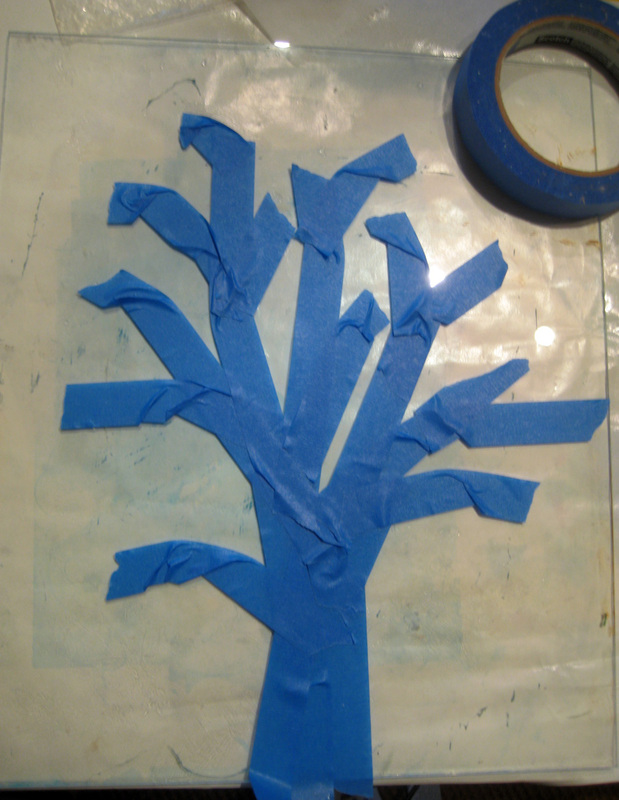 With strips of tape, I created a tree shape. I didn't over think it and I created it quickly. Then, using a brayer, I rolled the paint over the tape and onto the plexiglas. I used Golden Open Acrylics (because they are slower to dry) but you can use regular acrylics and work quickly (or add extender). 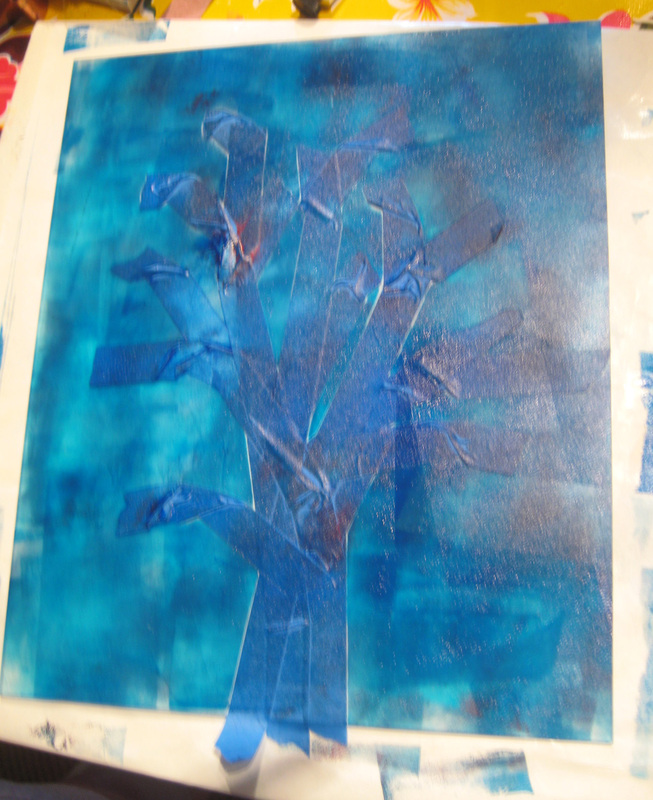 Cover the whole thing with paint, and better yet, blend a couple of shades of color. Next, peel the tape off the plexiglas. It's easy as it comes off in one big piece. 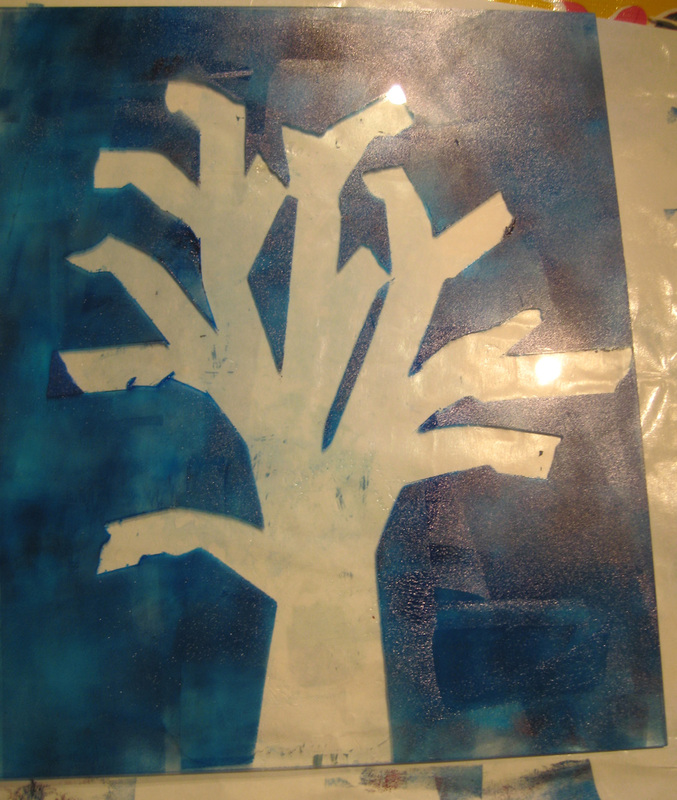 Shown is the plexiglas, with tape removed. The paint is still wet. 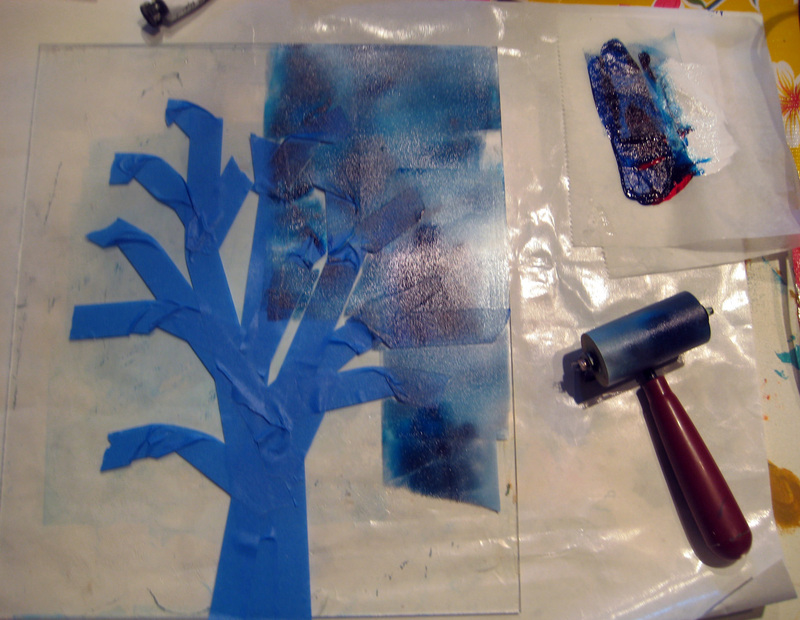 Place a piece of paper on top of the painted plexiglas, and brayer over the back to create a print. Lift off the paper and voila! 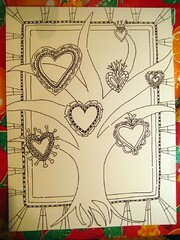 I did this sample on plain white paper, but as I showed you, you could do it on a collage, or previously painted paper. 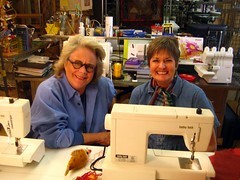 The extraordinary, Mary Fisher and me at her studio in Sedona, Arizona. April 2010. I'm home from a wonderful trip to Sedona, Arizona. I'll post photos soon! 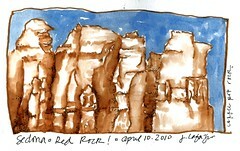 Did this quickly, with a watersoluble Tombo pen--the perfect color for those Sedona red rocks! A reader requested some additional detail shots of Above the Bog. 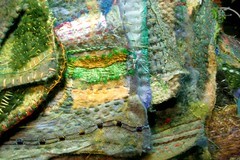 Go here, and I've titled all the bits that are in the larger piece.They are just hand stitched together and backed with a piece of commercial wool felt. 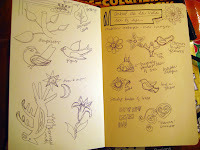 I drew these daisies yesterday, quickly, using a continuous line in ink. Then scanned them, and in photoshop, used the 'stamp' filter. 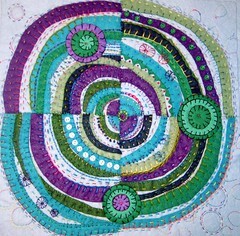 I plan to use them in my collages or maybe even in my quilts. I'm off on an adventure this weekend, to Sedona, Arizona. 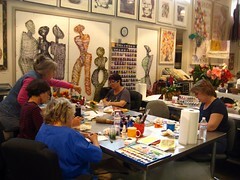 Teaching a private workshop at Mary Fisher's. I'm waaay excited! See you next week. Your faithful SAQA co-rep about town! 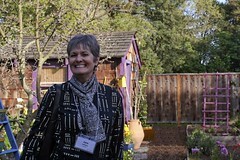 Loris took this photo of me last month in Palo Alto. This stack of needle-felted hand stitched pieces became this which was juried into Beneath the Surface, which will be a special exhibition at the Long Beach Quilt Festival. You know, I'm nearly mumble-humph-years old, and now truly realizing the best way for me to work is in smaller pieces, and just work, with no plan, and then once I have 'enough' compile them to something larger and significant. 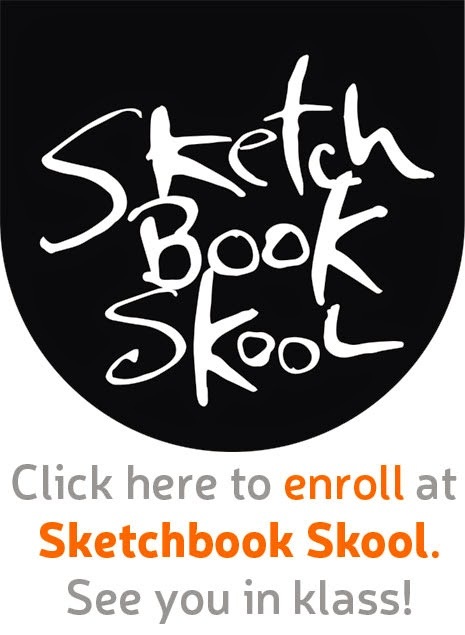 Registration begins today online here. 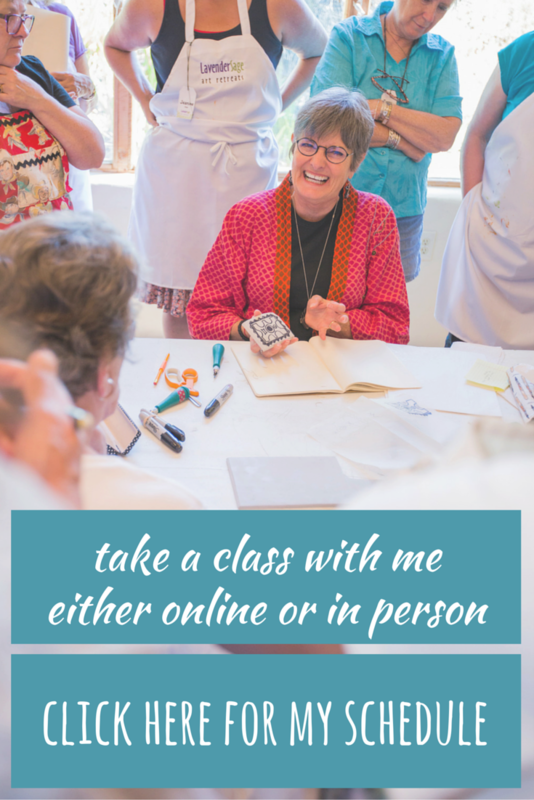 I'm teaching two workshops on Thursday, July 22. 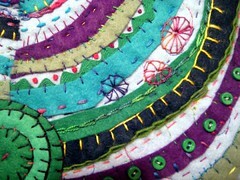 Quiltlets: Very Small Quilts for short attention spans, and Floral Design Stamps-design and carve your own. 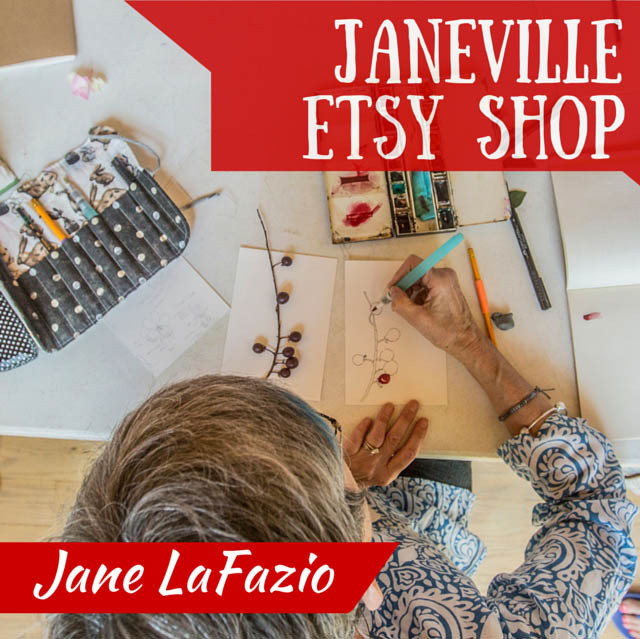 Running with Scissors Studio blog interviewed me! Check it out! What do you think? 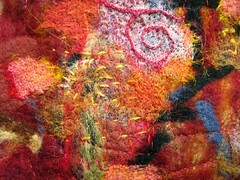 A detail shot of a 12x12" needlefelted/stitched piece for little local SAQA group exhibiton of art quilts (downtown san diego, reception June 13, 3pm, I'll remind you). Check one off. I've wanted to learn to weave and yesterday I did! I took a one day workshop with Christie Dunning, at Bravo Workshops. She had prepared the loom with the threads for the warp, and I wove the weft. (note the terminology I learned!) 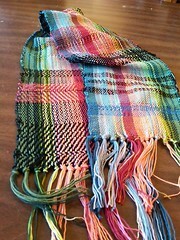 It was really pretty fun, and I enjoyed weaving and now will be able to appreciate it even more. Will I become a weaver? No, not unless I have an assistant who always does my warps! 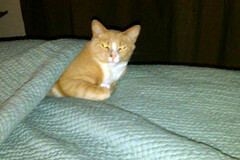 Here I am modeling my scarf and here it is in progress. 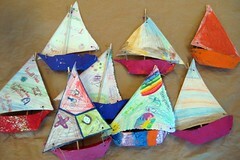 My Mundo Lindo kids made the boats from Ann Wood's tutorial.